Kris, I would like you to try some chocolates. When I heared these words from Zoi Papalexandratou (Zoto.be) – my attention was instantly grabbed. Zoi works at the heart of the cocoa production. Zoto offers guidance to both chocolate makers and cocoa farmers and visits cocoa producing regions on a regular basis. During one of het last trips, Zoi tasted the bars of Valle Canoabo and brought some bars along for a review. It doesn’t get any better than this. Chocolate bars, made in Venezuela at the actual hacienda where the cocoa was harvested. Not only does this make a single estate chocolate, it is even “tree-to-bar”. The chocolate is made on the exact spot where the cocoa has been grown, harvested and fermented. It offers the chocolate maker total control over both raw materials and the final product. It is a trend that is noticed all around the globe. Chocolate makers at the source of the cocoa start popping up all over. Rather than growing and exporting the beans, they take care of every step up until the final chocolate bar. And with great results. Experts in the fine chocolate world predict a lot of new chocolate makers will emerge in the near future. 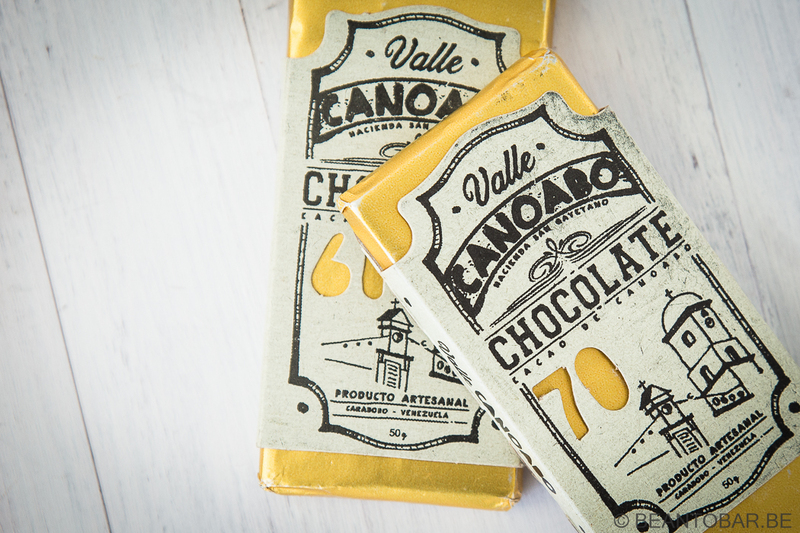 Valle Canoabo Chocolate is based at the Hacienda San Cayetano in Canoabo Venezuela. This country is widely accepted as one of the birthplaces of cocoa and offered some of the highest quality beans all through history. Canoabo, situated in the north part of Venezuela, close to the Carribian Sea. It’s cocoa has been used in a variety of bars made by renowned chocolate makers such as Solstice, Domori and Bisou Chocolate. But this time we get it straight from the source. The plantation Hacienda San Cayetano grows delicate criollo cocoa, making it a great source of high quality cocoa. The bars I received are the 60% and 70% version of the Canoabo origin. The packages are very different of your regular chocolate bar. I can’t explain why, but they just feel Latin American, The gold foil showing through make them look like precious gold bars. The outer wrapper in cardboad show a drawing of a village church and add to the South American vibe. The design of the wrapper, the font used and the style just add to the whole idea. Flip it over and contact info on the chocolate maker is give. The ingredients are cocoa mass, cocoa butter and sugar. The bars I received were made in May 2016. The package might not be as slick as other premium chocolate bars, but it sure is original. I really like the mood it sets. However, repacking your chocolate if you don’t have a whole bar is a bit cumbersome. There is no way to slide the bar back into the cardboard sleeve. But this is merely a detail. The bar itself is thick and lush. The design is a simple rectangular scoring of the chocolate tablet. Molding hasn’t been done to utter perfection, but I’m rarely put of by this. I think it shows the production is on an artisan level. 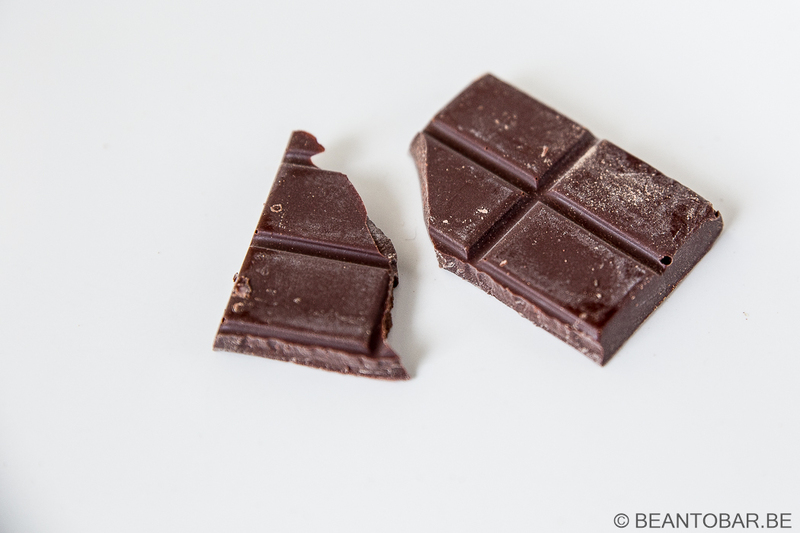 Unfortunately the bar showed some blooming due to the travel circumstances – it does no justice to the work of the chocolate maker, yet doesn’t affect the taste of the chocolate. Taste: Roasted nuts pop up when the flavor takes off. Gentle smooth flavors are released, focussing on lush chocolaty notes. The flavor remains warm and sweet. There is a hint of dried yellow raisins and deep molasses. The aroma keep on building in intensity. Generous and appealing. Near the end of the melt, suddenly some coffee kicks in and the long lasting afterflavor focusses on the earthy, nutty notes we found at the very start. Chocolaty with a capital C and very satisfying. Texture wise, this chocolate is a tad coarser than many European style chocolate and it resists to melt longer. But when it melts it offers a very pleasant mouthfeel and keeps going on for ages. A very interesting chocolate, full flavored and not overly sweet – even though it is only 60% cocoa. Taste: It starts slower than the 60% and goes straith for the chocolaty notes, passing on the nutty flavors. There is a etheral floral note present, hard to determine the exact note. Some wood appears aswell. 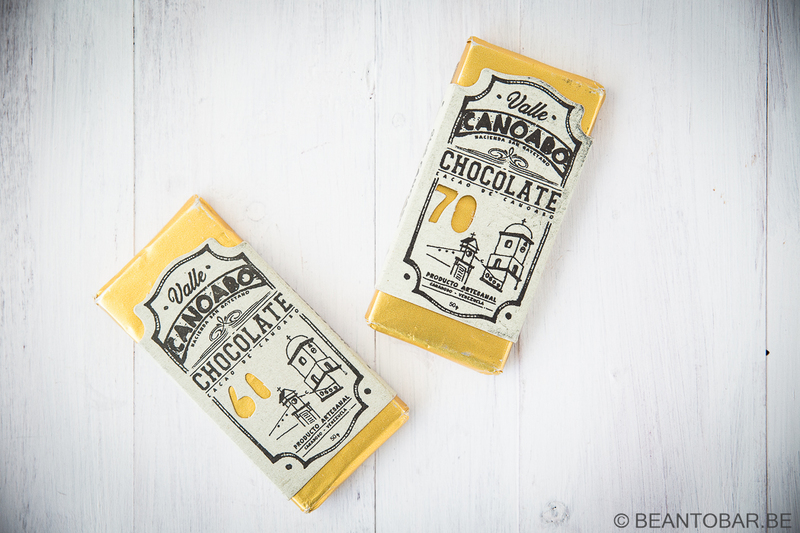 This bar shows delicate yellow fruits (apricot – mingled with the chocolaty tones). The texture seems smoother than the 60% bar and the melt goes on forever. It seems more delicate and more complex than it’s counterpart. The afterflavor concentrates on the chocolate tones and wood ones more. Surprisingly, each bar shows a distinct character. The 60% has a rounded flavor profile that keeps building and building in intensity, while releasing wonderful warm and sweet notes. The 70% seems more delicate and shows some unexpected flavor changes. From chocolaty to floral, curbing to fruity and ending woody. It is darker and more complex – making it very enjoyable to retry over and over again. Delicious and my favorite of the two bars. I’ve tried the 60%, very rich, strong and delicious! Perfect for a lazy afternoon, the taste is intense but pleasantly sweet, like fruity (grapes, raisins) and the texture is perfect: crisp and firm but melts like a delicious cream in your mouth!